S.A.C. 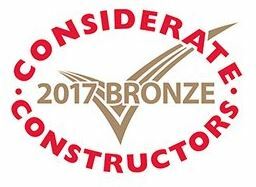 Construction are extremely pleased to announce that we have received (for the second year running) a National Company Award from the Considerate Constructors Scheme. The award was presented at a ceremony held at the Four Seasons Hotel in Park Lane, London on the 2nd of November 2017 where S.A.C. 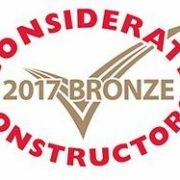 received the bronze award. The annual event serves to reward the companies who have demonstrated exceptional levels of consideration against the Scheme’s Company Code and Checklist over the year prior. 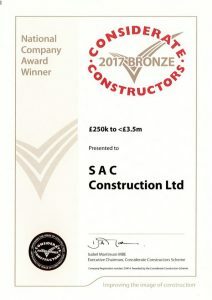 Only the highest scoring companies are eligible to win either a Gold, Silver or Bronze award, with one Gold Award winning site from each value band being honoured with the prestigious accolade of Most Considerate Company. A big thanks to all the team for their efforts, lets see if we can change the colour next year!